$50 cash added along with jack pot drawing for two T'shirts. 3-3-07 $100 Added! North Alabama Open ... in Cullman,AL. 9-8-07 $100 Added! Cullman Foosbash ... in Cullman,AL. 11/2-4 Alabama State Championships ...in Madison,AL. @ "The Station"
Congratulations to the Alabama State Champions for 2007. It was a fun weekend of foosball competition in Madison, Alabama where the youngster from Jackson, Mississippi, Daniel Colter, was able to return and defend his "2006 open doubles state title"---this year he was teamed with Chattanooga, Tennessee's "Bad Boy" foosball player Bruce Stancel. Outstanding foosball players and top-notch competition filled the tournament area during the weekend where "The Station Pub & Grill", provided nicely as the host for our annual tournament. After other main event action during the weekend Michael Bates captured the 2007 open singles championship title defeating, in the finals, none other than the red hot young Daniel Colter. The 20th annual Alabama State Championships of foosball is scheduled for the weekend of November 2nd - 4th 2007. All are invited to participate in the competition for another chance at a niche in our Alabama foosball history. The titles up for grab this year include: the always competitive open doubles(main event) and open singles, along with the under-pro doubles and singles events. We expect players from many areas of the state, as well as, a few from surrounding states to be in town for these and other specialty events to be featured during the weekend. The tournament value will exceed $2,500 this year and will provide for a weekend of foos-fun for all who participate. Please note: Alabama State participating players will be required to support the tournament by entering the "main event(open doubles)" before becoming eligible for most of the events of the tournament. For those eligible, "Ala-Amateur only!" events will be featured which will award 1st place trophies to winners of a singles, doubles, and a draw-for-partner events. Entry to the Ala-Amateur events will be $10 per event and will be restricted to only those players deemed locally active and who are listed in the Program's class ratings at BEGinner,D-class,C-class,and B-class. A special package deal entry fee will be offered for the Ala-Amateur players-- $60 will cover the required entry to the main event, open doubles, the under-pro doubles, and the three Ala-Amateur events; however, pre-registration is required in order to get this special price. Ala-Amateur events will be played at 7pm on each night of the tournament beginning with singles on Friday night--don't be late! Good luck, and I hope to see everyone at Alabama State 2007. The Huntsville Foosball Program bids farewell to a long time gathering spot for the local tournament playerbase. The Billiard Street Cafe will be shutting it's doors soon. The property was sold and the new owners intend to use the building in another capacity. Huntsville players will be moving their weekly foos program to another bar approximately 10 miles west to the suburb city of Madison. 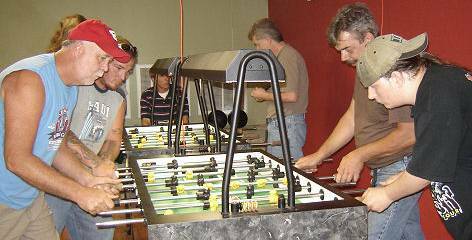 The Wednesday night foosball tournament will be coordinated at The Station Pub & Grill located at 8694 Madison Blvd. beginning Wednesday June 12th. The locals are very excited about the new foos-location which turns out to be practically in the back yard of a couple of the tournaments frequent participants, and then to boot, it's actually closer to many of the regular and occasional participants as well. Hurry by and check it out! The location phone number is 256-325-1333. On February 1st, the weekly "Handicap Draw" tournament in Cullman will feature CASH ADDED!. Observing a "2007 Kick-off" promotion, $50 will be added to the tournament payback breakdown during the month of February, along with an additional $20 to a random Jack Pot Drawing winner. Come getche-some! The United States Table Soccer Association has recently adapted a few RULES CHANGES effective in 2007. The following rules changes will be initiated when applicable within the tournaments of the Southern Foosball Program beginning January 1st 2007. *The serve is possession on the five-man rod, and at the middle player-figure where it can be placed by hand. Play shall begin immediately and time limits start one second after the ball touches the second player figure. Additionally, the ball can not be advanced until one full second after touching that second player-figure. *A ball that goes off the table shall be put back into play in the goalie area of the team who did not cause the ball to go off the table. Cause would be defined as the team who caused the initial movement and force on the ball which ultimately results in the ball leaving the table and out of play. *A out-of-reach dead stopped ball will be put back into play at the goalie area closest to where it went dead. A dead stopped ball between the five man rods shall be served by the team last scored upon. *Purposely lofting or lobbing the ball over the opponents' rods will be illegal. Example: Aerial Shot. *During multi-game matches, 90 seconds time limits will be allowed between games. Practice will be allowed during this time. *A 3rd time-out shall result in loss of possession with the serve awarded to the opponent. Subsequent violations will result in a technical foul. Congratulations to the Alabama State Champions for 2006. It was a smaller than normal Alabama State tournament but was still filled with plenty of top-notch action and competition. Almost 40 players participated in the 19th annual tournament which featured 7 events during this 2006 New Years holiday weekend. Daniel Colter, a 14 year-old member of a group of players traveling here for the tournament from Mississippi, practically stole the show while he and his partner, Mike Flynn, won both the main doubles events, open doubles & under-pro doubles. Daniel also won the under-pro singles event and finished 2nd place in the open singles event. Personally for me, it was very refreshing to see Daniel playing foosball at the proficient level he has attained. My goodness, at his age, you'd expect to see him piled up in the corner somewhere playing the newest GameBoy Advance toy that Santa Claus had left him a week earlier. On to other news, Atlanta's Mickey Munger was unable to defend his 2005 open doubles state title but was able to earn the 2006 title winning open singles. And finally during the Alabama-Amateur portion of the tournament local player Mike Perry won singles while Chris Twilley won doubles teamed with Derek Pendergrass. Rodney - We've finally got foosball back in Mobile. We just got started this past Thursday night. If you know any foosers headed this way, please pass the word. Thanks! The 19th annual Alabama State Championships of foosball is scheduled for the last weekend of this year December 29th - 31st. All are invited to participate in the competition for another chance at a niche in our Alabama foosball history. The titles up for grab this year include: the always competitive open doubles(main event) and open singles, along with the under-pro doubles and singles events. We expect players from many areas of the state, as well as, a few from surrounding states to be in town for these and other specialty events to be featured during the weekend. The tournament value will exceed $2,000 this year and will provide for a weekend of foos-fun for all who participate. Please note: Alabama State participating players will be required to support the tournament by entering the "main event(open doubles)" before becoming eligible for most of the events of the tournament including the special Ala-Amateur events. I'm troubled greatly to pass along the following news: A dear person among our foosball family has passed away, Tony Gamso had a massive heart attack and passed away at his home on Thursday November 2nd. Tony's wife apparently came home from work to find him dead. Tony was a great guy and I will miss him tremendously as will all of us within the foosball community of which he was a major part. Since distributing this news, I've had many-many responding emails and phone calls from people within the foosball community extending their condolences as well.